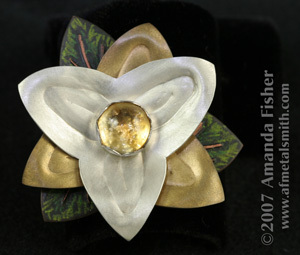 The lovely trillium flower inspired this brooch, and I used its graceful shapes to explore various fabrication techniques. While it's not obvious in this photo, the piece is very 3-dimensional- from the base of the leaves to the top of the petals is about 0.375 in (9 mm). The flower petals were first embossed using forms on the hydraulic press to get the petal texture, then formed by careful hammering into metal- careful so as not to flatten the embossed textures. The leaf base was first etched, then colored and patinated. The flower's center is a 10 mm natural citrine, and the bezel setting was textured under the stone and the bezel hand-carved in scallops. The various elements were, at last, riveted together. The piece is waxed and polished to protect the finish. This is one of 2 similar pieces; the other is in my personal collection. Sterling silver, rich low brass, copper, steel pin, citrine. 1.75 inches (43 mm) x 1.75 (43 mm). For sale: $200 US. Please email me for details.